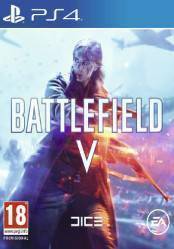 Note: This version of Battlefield V for PS4 can be in different formats. On the one hand the physical version and on the other the digital version. digital versions can be in code or account form, and both can be regionally locked, so pay attention to each of the versions in the different stores. The new installment of DICE's prestigious war franchise is scheduled to be launched on October 19, 2018 and this fifth installment will place us in World War II. One of the novelties presented or already known, apart from the incorporation of a game modality in the form of Battle Royale, is that in Battlefield V the weapons will have their own personality, with special emphasis on the progression of each one of them, with different parts that we can modify to adapt them to our style of combat. Another of the most popular new features in this Battlefield release is the disappearance of the old DLC business model, i.e. there will no longer be a Season Pass or Premium model, and all DLCs launched will be free of charge for all users. There are no comments yet about Battlefield 5. You can be the first one! Battlefield 5’s real-money currency arrives April 4. Here’s what it buys. BEST STREAM MOMENTS! | Battlefield 5 Firestorm Victories.